I forgot all about this until just before the Super Bowl this year, when B2 said, in a sudden onset of one of his good ideas (which almost always have to do with potatoes, it seems), “You know what would be really good? 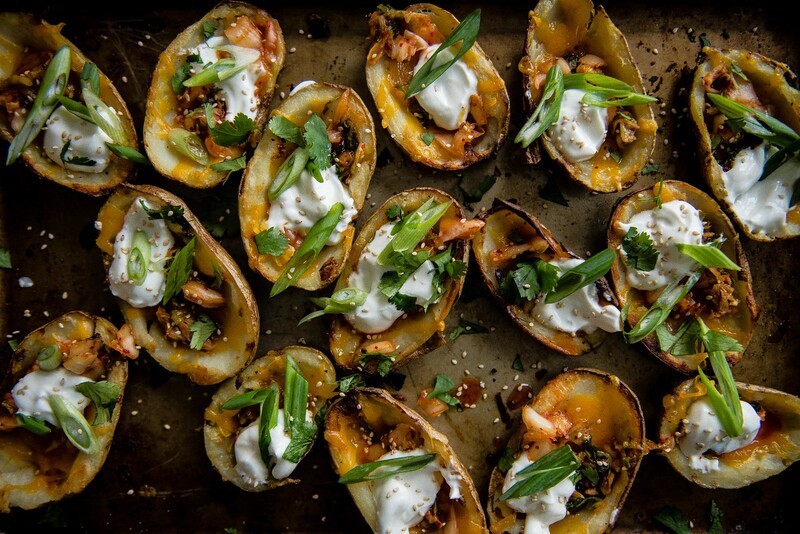 Kimchi and potato skins.” Yes! Yes, it would. So there was only one thing to be done that Sunday, and that was revisit my old favorite appetizer (even if it meant paying for them this time). 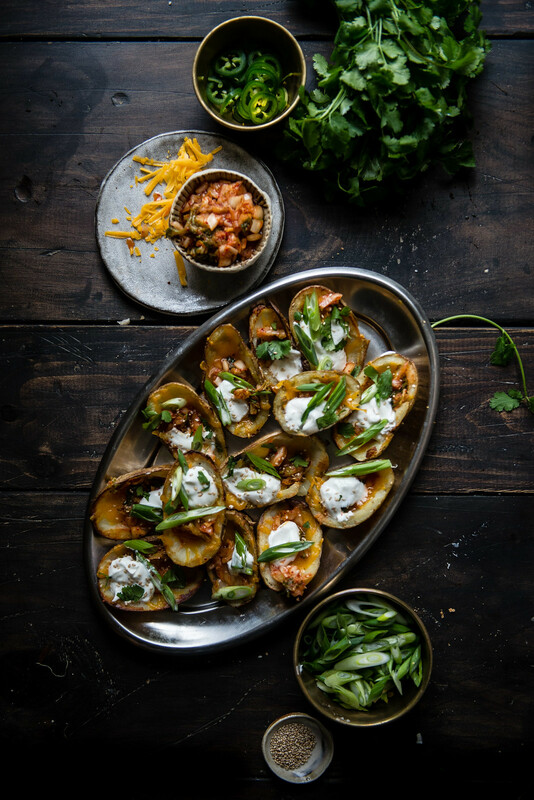 A pile of cute little potatoes were bought, baked until crisp and filled with melted cheese, a quick kimchi relish, sour cream, and scallions. Kimchi goes and makes an already wonderful thing even better — it adds a little bit of heat that goes perfectly with the cheese (I am always a supporter of kimchi and cheese) and a pungent tang that matches the sour cream and sharp scallions. On top of that, the tart spice and fresh crunch helps to lighten everything up just a little bit. If you wanted, you could crumble some bacon or fry up some slivered pork belly to add more heft, but we loved these just as is, and between us, finished the entire pan by the time Lady Gaga came on. Bacon crumbles or thinly sliced and cooked pork belly wouldn’t be amiss here, added to the potato skins along with the cheddar; we omitted it just to keep things a little, little bit lighter. Preheat oven to 400° F. Thoroughly scrub the potatoes until clean and let dry. Rub the potatoes with oil and sprinkle with salt and black pepper. I used about 2 tablespoons oil and ½ teaspoon each salt and black pepper. 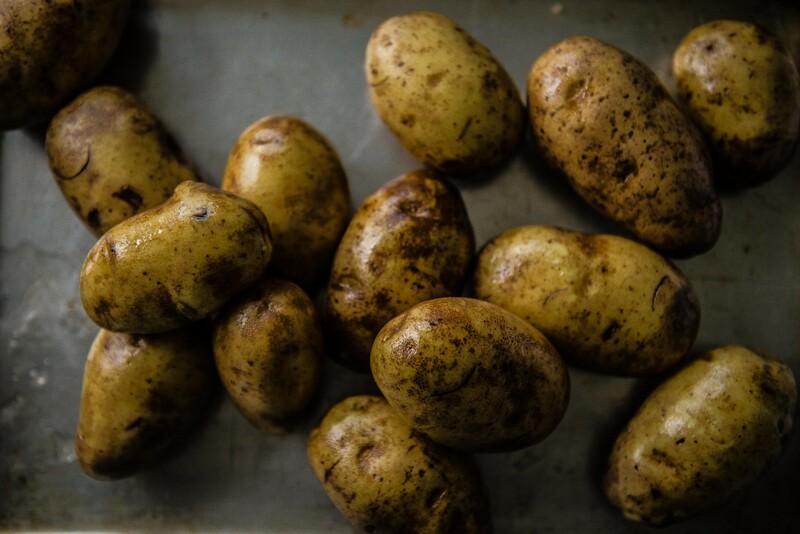 Prick potatoes all over with a fork or knife, then place them on a baking sheet and bake for 50-60 minutes, or until skin is crisp and potatoes are tender. Mix the remaining 2 tablespoons vegetable oil and 1 tablespoon sesame oil together in a small bowl. Brush both the skins and the insides of the potatoes with the sesame oil mixture and season the insides with more salt and pepper. 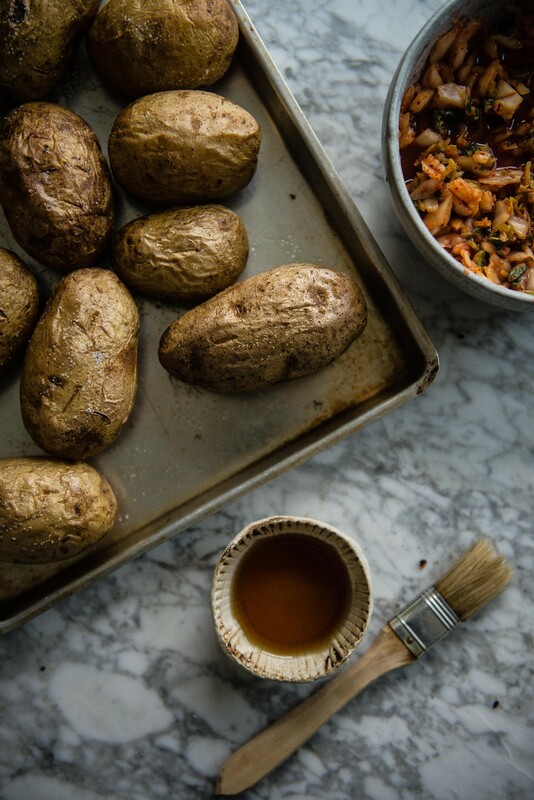 Place the potatoes cut-side down and bake until skins are crisp, about 5-8 minutes, then flip and bake with the cut-side up until edges are browned, another 5-8 minutes. Meanwhile, stir together the kimchi, honey, and rice vinegar in a small bowl. 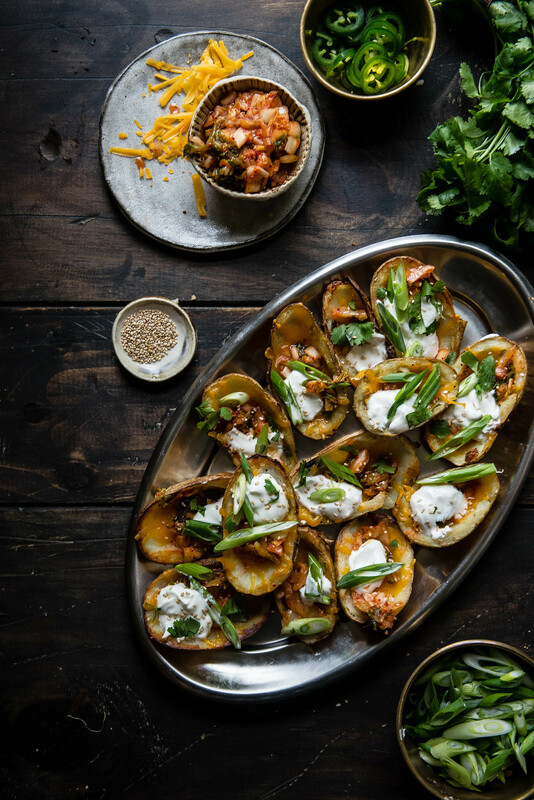 When the potatoes are done, sprinkle each potato skin with garlic powder and 2-3 tablespoons shredded cheddar and return them to the oven for a final 3-4 minutes, just until the cheese is melted. 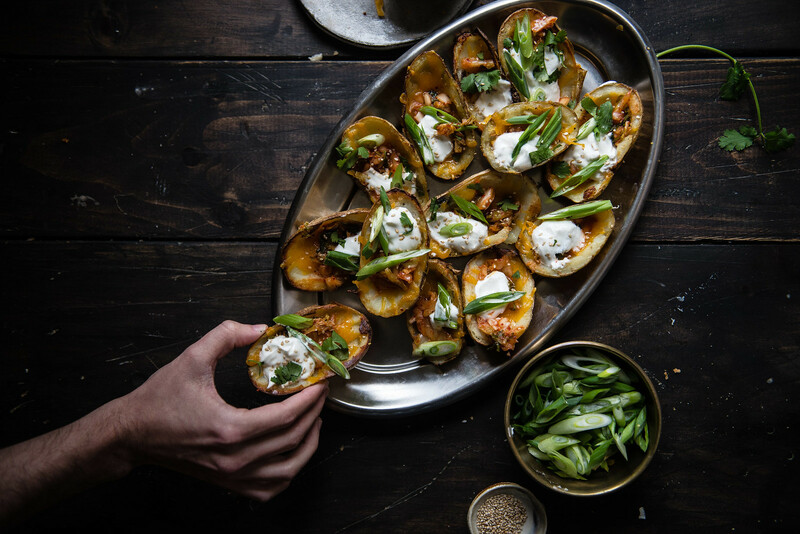 Serve topped with kimchi relish, sour cream, cilantro, and scallions. These are a bit more involved than I realized before I tackled them, but they're not hard, just time-consuming, and can easily be broken down into manageable pieces if you plan ahead more than I did. 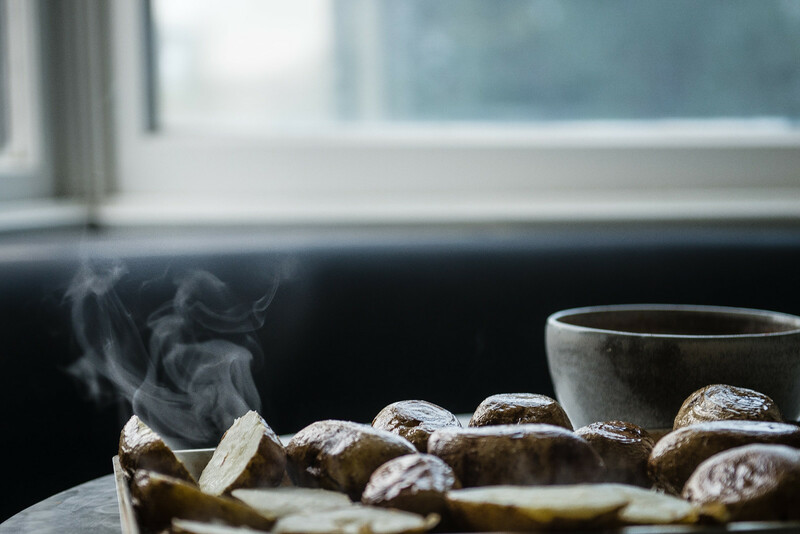 Bake the potatoes one day and scoop them once chilled, then save the skins to crisp up and fill with toppings on the day you'd like to serve them. whenever it was my turn to pick restaurants as a kid, i’d pick tgi friday’s just for the potato skins. love the sound of adding kimchi to them! and agree that kimchi and cheese should always go together (kimchi quesadillas with a quick sriracha mayo are also delicious). While I was in the Army I had a Korean friend intro me to Korean food and especially KIMCHI which I LOVE- So my question, is any chance you are going to open a restaurant soon? 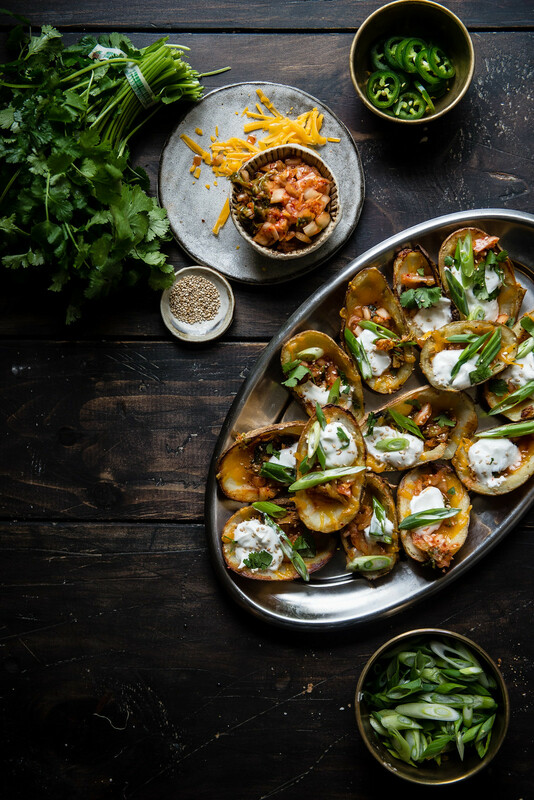 Love the idea of potatoes with kimchi! 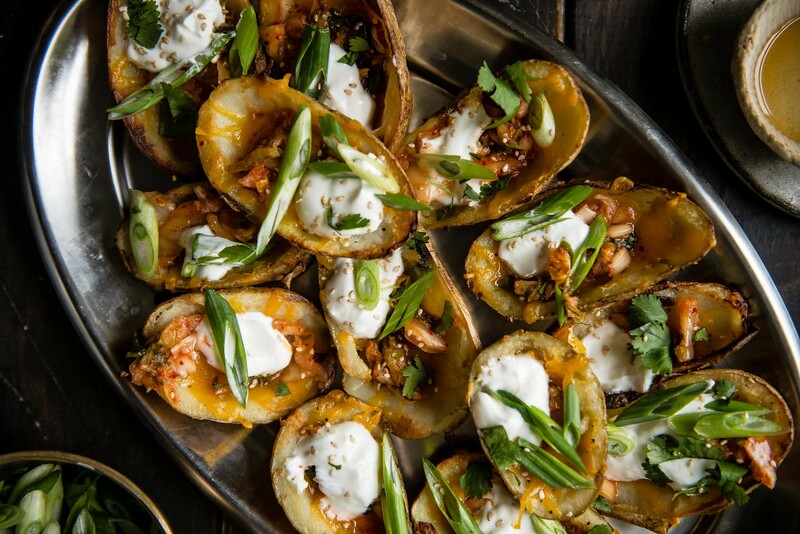 Oh my gosh, I love kimchi with fries, so this is next level — and easier to eat since the skins are the perfect vessel for all that wonderful filling! Trying to eat more Kimchi for its health benefits with a recipe like this I don’t think it’s going to be hard!